Understandably, one of the things in high demand in quake affected areas is baby goods. Our local hospitals are collecting and sending supplies of baby milk (脱脂粉乳), diapers etc. Check with yours if they're running something similar. As you can imagine at times like these there are lots of rumors about. Unfortunately this was one of them. I am sure that many hospitals and city halls etc are collecting things like this ours wasn't. 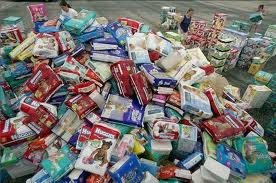 We have found a lady who is doing this kind of collection, which is lucky because I think it is going to be a while before we need nappies and baby milk! So just be sure to check information for yourselves, don't rock up places with nappies only be to told to take them home!